WataugaWatch: Will David Blust et al. Run as "Nathan Miller Republicans"? Will David Blust et al. Run as "Nathan Miller Republicans"? Reading about County Commission Chair Nathan Miller's vindictiveness toward Watauga County Schools and seeing that Commissioners David Blust and Perry Yates were nothing but bobble-heads in agreement with the Miller agenda raise a question about the November elections in Watauga County. Does the local GOP intend to run on the Miller record and uphold the Miller philosophy? Where does Karen Lerch stand on Nathan Millerism? She has been overheard to say that she hasn't even studied the "issues" yet, but a moment of truth approaches for her. Commissioner David Blust has departed from Millerism at times, especially (and most recently) on the quickie deal engineered by County Attorney Four Eggers that would have given the town of Beech Mountain access to Watauga River water. And on that other scheme to build a commercial business park on Hwy 194. Political considerations (that is, reality) overruled Blust's usual party-line kowtowing to Miller on those votes. Otherwise, Blust is generally in complete and serene agreement with his chair. 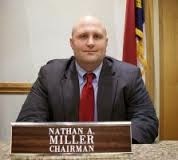 As it's been Nathan Millerism that has dominated actions and attitudes for the last two years on the Watauga County Commission, this upcoming County Commission election is likely to be a referendum on a man who is in the process of being involuntarily sidelined from political office because of his personality, his political philosophy, and his character. You nailed it! Why would anyone support a Commissioner who believes in holding the line on property taxes, keeping the County's spending under control, paying off the public debt as expeditiously as possible and resisting the temptation to undertake more public debt ? We need to vote these Neanderthals out and replace them with a "progressive" regime that will raise taxes, float more multi million dollar bonds and dole public tax dollars to every liberal advocacy group that comes begging for a hand out. I am a moderate Republican who will never march with the liberal "throw a handful of money at it" crowd. However, the many local volunteer groups who look to the betterment of our community should be applauded. These people, with little investment by taxpayers, do more good for our community than government controlled programs ever could. I am sorry my party has lost sight of the fact that republicans believe strongly in local volunteers as opposed to government control. Mr. Wilson, As a moderate, its good to know you don't like "government controlled programs." As a conservative, neither do I. But I am afraid its a little too late to "rely on local volunteers as opposed to government." The horse has been let out of the barn and big government is on the loose. It will take a herculean effort to corral the beast. And GOP moderates just don't seem inclined to take on that challenge." So cyclops, what do we do, stiffle volunteerism altogether? Over the past few years, under both republican and democrat control, we have seen government come in the back door attempting to control our lives. We are prone today to look to government to do things for us that we used to do for each other, or for ourselves. I believe we should encourage volunteers in our community.